Yesterday I raced the Mc Carthy Toyota King of the Bay which was race 3 of the Series. I really felt good, and finished strong. I have been in Durban for a whole week now, although it feels like a month. Been so busy, warmer weather and water, and the extra morning daylight hours have made my days pretty full of activities. Loving it so far. Durban – Matt Bouman secured a hat-trick of wins in of the Discovery Men’s Health Surf Ski Series with a dramatic win in the McCarthy Toyota King of the Bay surf ski race, after he took an early break out of the harbour on a boat wave and never looked back. Bouman, together with Eastern cape star Richard von Wildemann and Barry Lewin broke away from the pack once out of the harbour, and once Bouman took the gap on the boat wave it was up to Lewin and von Wildemann to fight it out for second and third place. However, even though Bouman raced alone he said that knowing Lewin and von Wildemann were racing behind kept him focused. “They kept me honest,” Bouman said good humouredly. 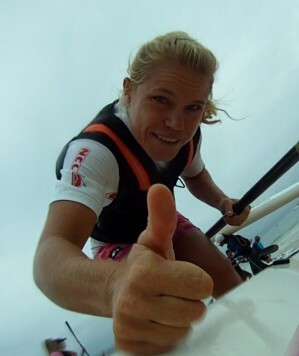 Bouman had been hoping to race against Hank McGregor on this leg, but said that he understood McGregor taking a breather after winning the Molokai race in Hawaii. The woman’s single race followed a very similar pattern to that of the men’s with Michèle Eray of Plettenberg Bay well ahead and Michelle Eder and Donna Winter fighting in out for second and third places. The 22km McCarthy Toyota King of the Bay surf ski race is a favourite with locals and national paddlers alike, as it is the one time in the year that paddlers are allowed to paddle out of the Durban harbour mouth. Backmarkers during the race had to jostle with massive container ship that exited the harbour at the same time as they6 were. Von Wildemann left the harbour mouth in a four boat pack that included Clinton Bollard, who rather dramatically raced the ski race in a K1 canoe, and despite his decision to take on the short course, he ran a considerable risk paddling the open kayak out through the harbour mouth and around to the finish at Ushaka Beach. As the morning progressed so too did the swell and the wind making things tougher for the stragglers fighting the elements.